The ASUU president for the 2018-19 academic year is Connor Morgan. Photo by Rachelle Fernandez. Associated Students of the University of Utah’s (ASUU) freshly elected student body president, Connor Morgan, aims to break the barriers between traditional and non-traditional students and kick the “bad reputation” that has followed ASUU in the past. “ASUU has had a reputation for being Greek-dominated, kind of an old boy’s club,” Morgan said. He plans to take student government in a new direction by working toward more inclusivity. Majoring in biology and political science, the 21-year-old honor student pushes for more events catered to all students, non-traditional and traditional alike. As president, Morgan encourages events like RedFest, but also champions other events like the upcoming family movie night planned by ASUU’s Student Immersion and Outreach Board. It is meant to cater toward non-traditional students who have spouses or children. “ASUU is paying for this so you have a college experience and you can enjoy that college experience with your family and with your community,” Morgan said. 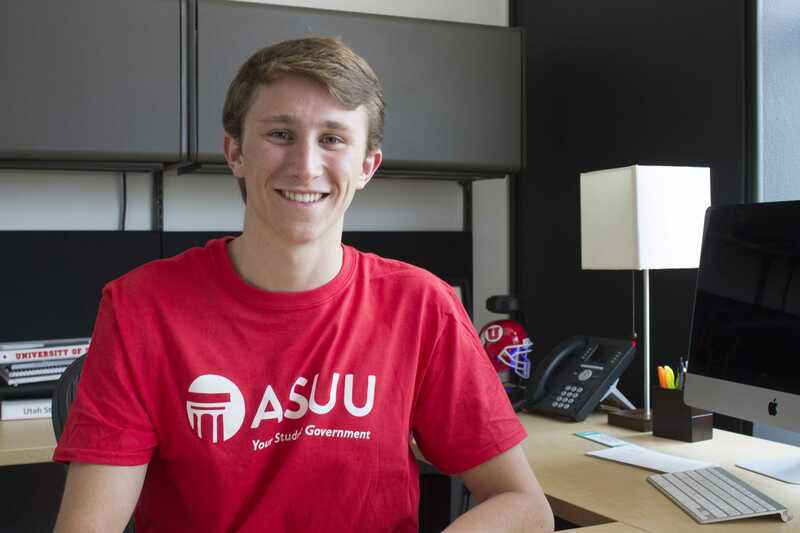 Morgan is taking on the ASUU presidency — a duty that requires at least 40 hours a week and service on the Board of Trustees — along with heading up the U’s Club Swimming and Diving team all while balancing out his 16-credit hour class load. His answer to handling these responsibilities is to stay ahead of the game. The new policies Morgan is looking to enact range from preserving the student voice in the U’s Retention Promotion and Tenure (RPT) proceedings, to protecting graduate students’ stipends. Although only one party running for ASUU administration remained on the ballot on election day, the road to the presidency wasn’t easy, but he felt it was a necessary path to make moves that better student welfare. The rules governing ASUU executive campaigns are strict. In order for Morgan to run for president, he had to resign from his position as attorney general (AG) on the first day of fall semester. On one hand, he could continue being AG — a position he enjoyed. On the other hand, he could risk his position and be removed from ASUU for one-year — a rule for candidates who lose the election. Morgan felt this could be devastating to the rapport he had built over the summer. Morgan resigned after serving three semesters as attorney general in August 2017. Before the presidential race started, Morgan was able to find two solid vice presidential candidates to run with him — now Vice President of University Relations Maggie Gardner and now Vice President of Student Relations Xandra Pryor. After a strenuous campaign the race was getting down to the wire. What sounds like a slam dunk, though, wasn’t quite. Students could still vote against Morgan and his ticket by giving a vote of “no confidence,” which would put a hold on the presidency until a search committee interviewed applicants and selected the next year’s president. His party, Rise, was elected March 16, 2018. Morgan’s inauguration was held April 25, 2018. Although ASUU models itself on federal and state governments with an executive, legislative and judicial branch, its mission is to provide for the general welfare of students attending the U. The difference between politics outside of the university and ASUU is it is a non-partisan government. ASUU presidents serve only a one year term, which is an arguably short amount of time to fix long-term problems within student government. “One year is enough to get a lot of things done, but to solve institutional issues, not really,” Morgan said. Therefore, Morgan is responsible for creating a strategic plan for the next president, whether that be a five-year plan or something as simple as just making sure the transition for the next president goes smoothly. “I think we need to set the stage for solving any problem between now and next April,” he said. You are the best your doing and what you achieve from where. Great dear Keep it up.